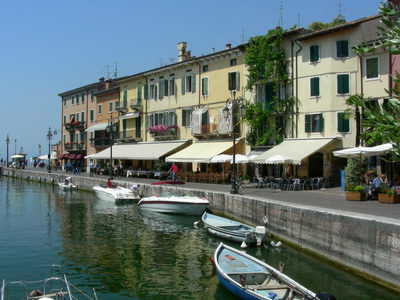 "Lazise has a particularly picturesque lake front and is a lovely historic town"
Lazise was a place we had driven by on the main road a few times, and apart from the Castle we thought that it didn't look that inspiring. 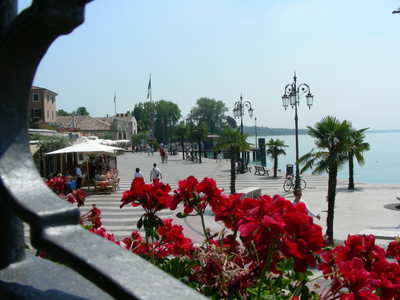 Thankfully for us, on a later visit we decided to explore the town, and as we wandered along the lake front promenade we realised what we had missing before. Do not let the commercialised theme park area below here put you off visiting Lazise, it really is a great place to visit, and one of our favorite towns. The lakefront is unique with its unusual paving and lovely ornamental lamp posts everywhere. As with many towns, there are tons of lake front restaurants. 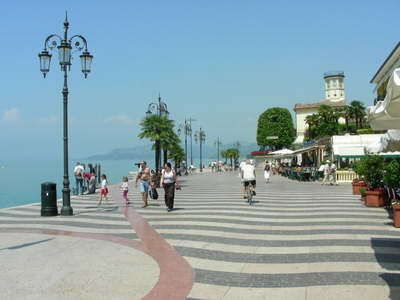 There are quite a few streets leading back to the lake, some of which open up into charming piazzas. Shops are plentiful here, so the main problem is having enough luggage space! There is a nice big car park close to the castle which is a huge bonus, and is easy for a nice walk into town. The walled castle itself is well preserved and covers a large area. The narrow port at the south end (near the castle), is a great place for just hanging out. There is also another port to the north side of town. To the south side of town there is a large and very nice beach. It is lovely fine sand (one of the few places you will find sand) and is a top place to lay back and soak up the sun. The bottom part of the beach is private (it belongs to a camping site), but there should be plenty of room for everyone. 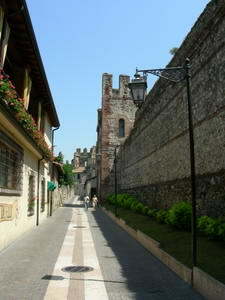 Click here to go from Lazise to the home page.